The talk started from a higher level, including marketing / business propositions, and has time passed it become more and more technical. 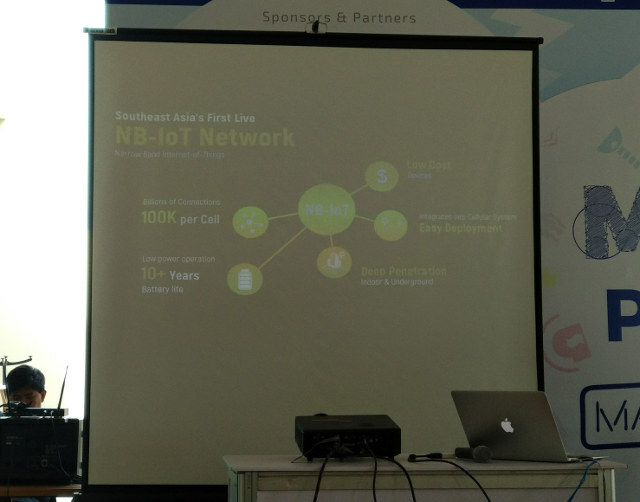 The first part of talk was presented by Phuchong Charoensuk, IoT marketing specialist at AIS, and he provided some more details about the company, and their current B2B IoT/M2M market (400,000 subscribers), before providing an overview of IoT, and how NB-IoT will bring in not only larger businesses but also startups and makers. 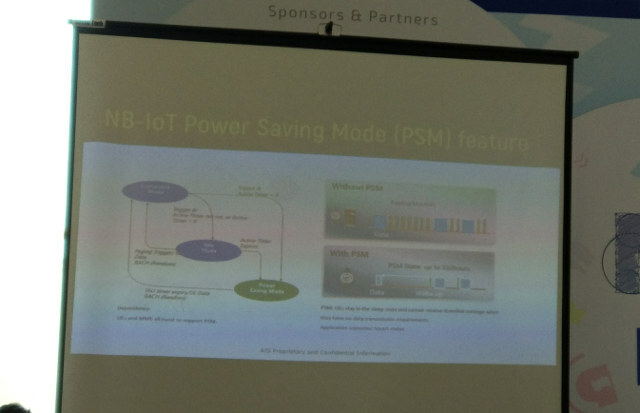 He also went through some of the benefits of NB-IoT network with (eventually) low cost devices, easy deployment, deep penetration (works indoor and underground), low power consumption with up to 10+ years batter life, and support for 100K connection per cell. 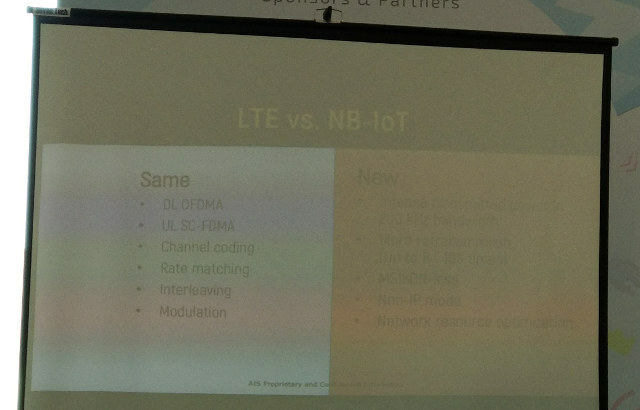 At some points he explained the different use cases of 4G, 3G, and NB-IoT / LTE Cat M1, and showed how LTE in automotive application was used by both the company to first track manufacturing and then telemetry, and the consumer for infotainment. 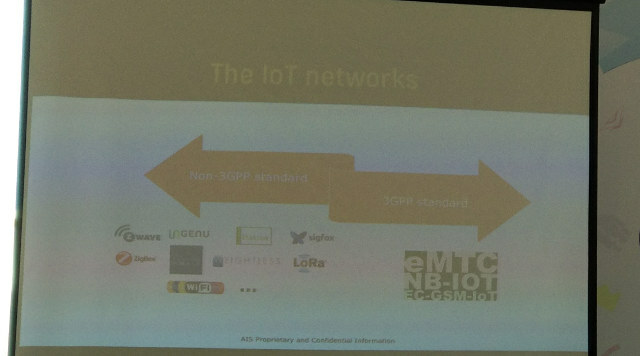 Of course, no NB-IoT here. 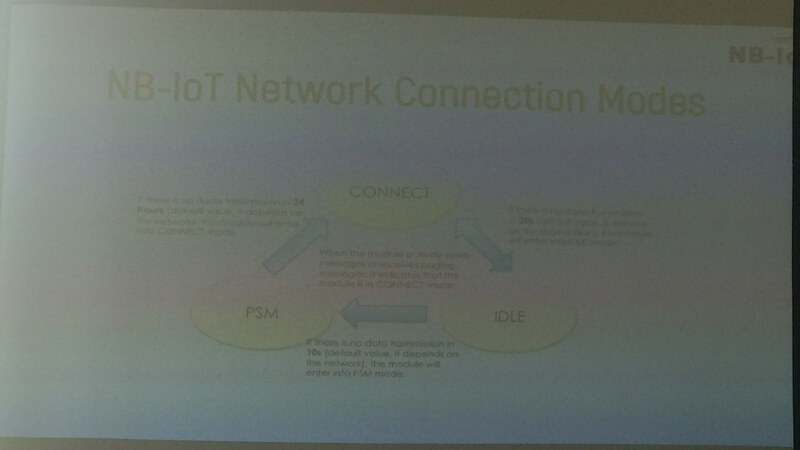 The second speaker was Jarun Sinsawasmongkol, Future Network Developer Manager, and he started from a slide by ndimensionz showing the differences between M2M and IoT, with the former more focused on machines, and hardware based, while IoT is mostly software based with the cloud and big data, although we still obviously need the sensors to get data. 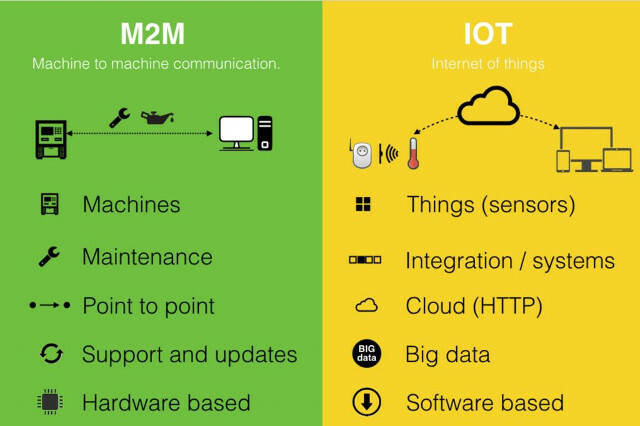 He went through the main component of the IoT network from B2C/B2C/B2C2B users, sensors and devices, the network itself which can be private or the Intenret, IoT platforms in the cloud, and finally the apps running on the platforms. 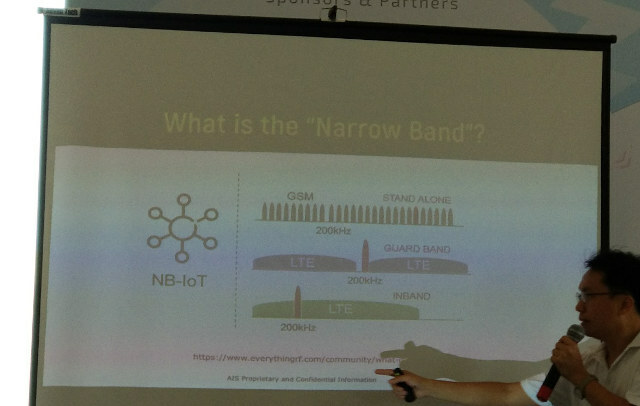 But before that an explanation of about NB (Narrow Band) means, basically NB-IoT communication just takes over 200 kHz either in standalone mode, in the guard band, or inband. 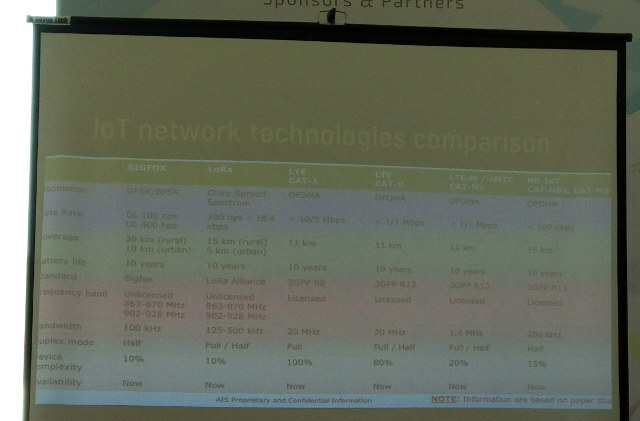 The table below compares Sigfox, LoRa, LTE Cat-1/0, LTE Cat M1 (eMTC) and LTE Cat NB1 (NB-IoT) with the latter having similar features and complexity as Sigfox/LoRa solutions. 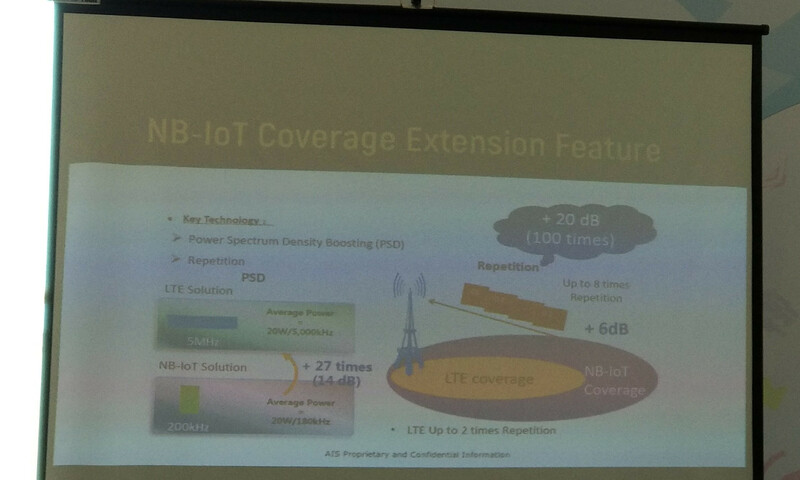 NB-IoT coverage should eventually be better than LTE coverage thanks to NB-IoT coverage extension features using power spectrum density boosting (PSD) and repetition to extend the range of a cell tower. NB-IoT power saving mode (PSM) is what makes 10+ years battery life possible, as the node can stay in sleep state for up to 310 hours. The final two speakers, including Pornsak Hanvoravongchai, Device Innovation Manager, dealt with the node / sensor part of NB-IoT. 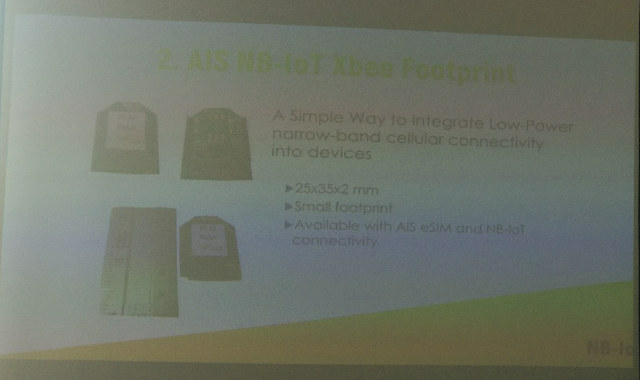 First, Nb-IoT should be using embedded SIMs (eSIM) instead of traditional SIM cards since they allow for smaller footprints, and are more durable with better resistance to vibration, high temperature, and humidity levels. 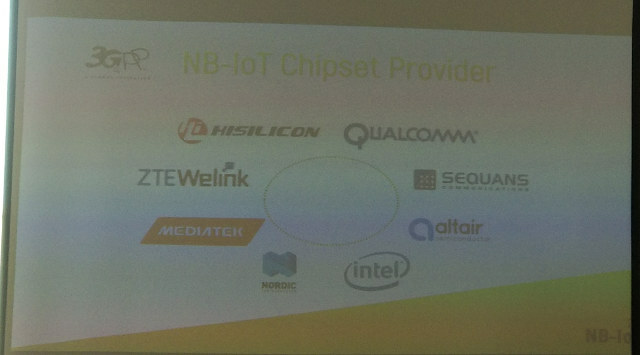 Plenty of companies are already involved with NB-IoT starting with Silicon vendors including Hisilicon, Qualcomm, ZTE Welink, Sequans communication, Mediatek, Nordic Semi, Intel and Altair Semiconductor. But as we covered a few days ago, there are also new entrants like Riot Micro. I just added links to the companies I had never heard from. 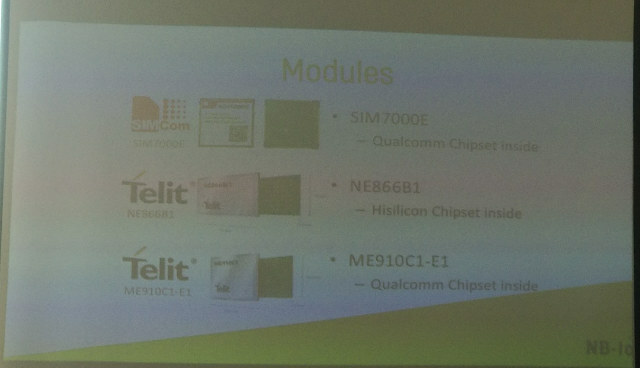 Some modules were listed on the next slides.. 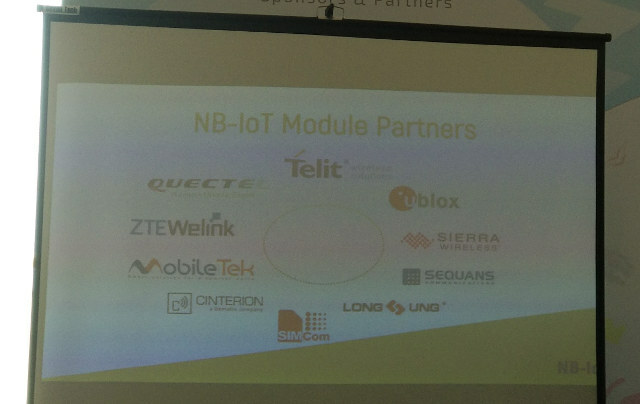 Some extra companies also joined the development ecosystem with devkits, MCU, sensors, or even antennas and batteries especially designed for NB-IoT, and other LPWAN standards. 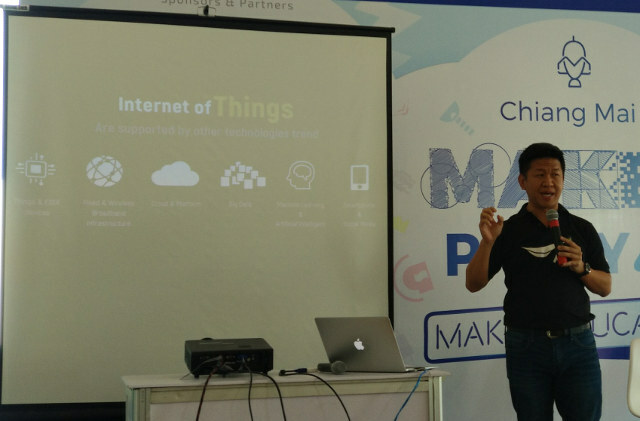 Finally, another person took over the talk with more practical technical information for makers. 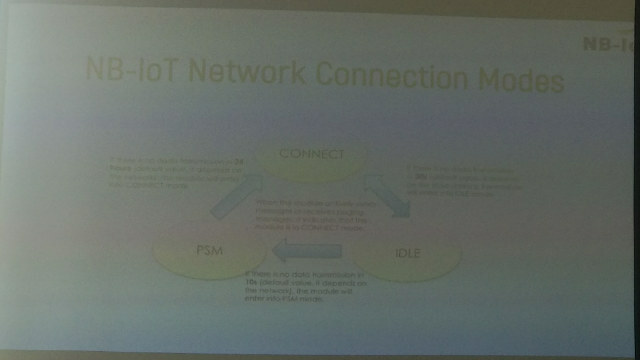 NB-IoT includes three connection modes: CONNECT while transmitting/receiving data, IDLE, and PSM (Power Saving Mode) where it does not attempt to make any connection for a given time, which depends on your own requirements. 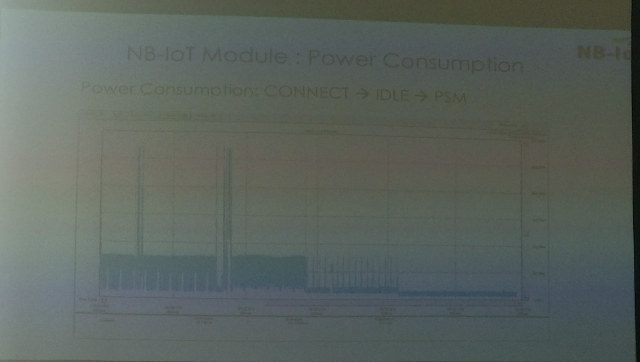 Power consumption for the three modes is illustrated in the chart above. I could see the scale on the right even during the live event. 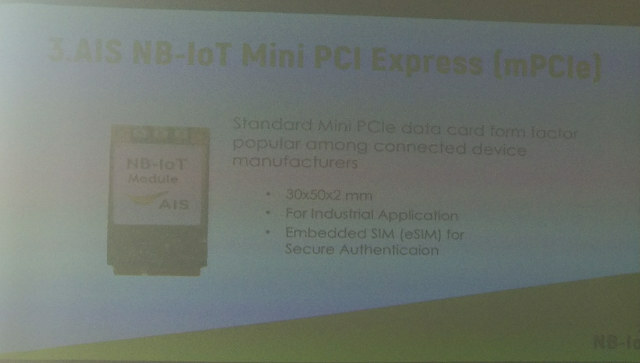 The company also introduced their NB-IoT Arduino shield with embedded SIM. 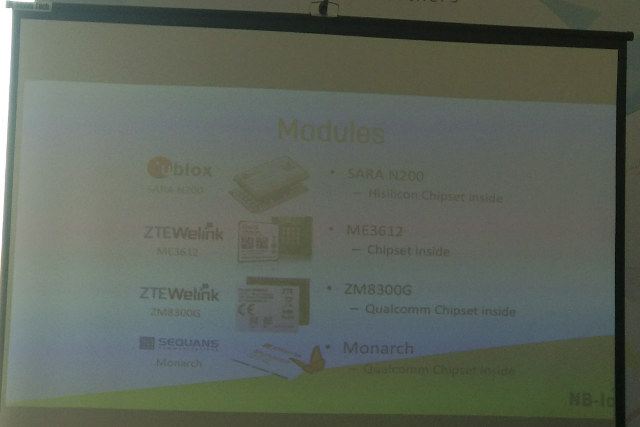 They also appear to have XBee and mPCIE (USB) NB-IoT modules, again with an eSIM. 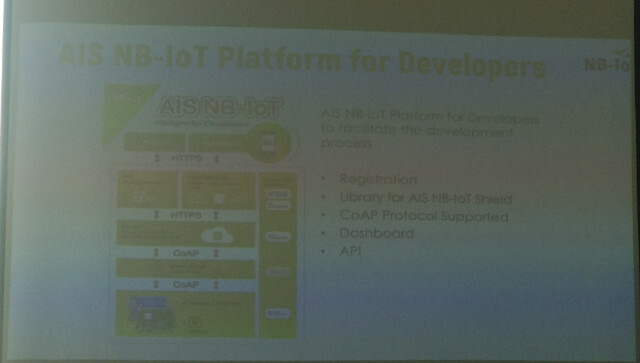 The software architecture of AIS NB-IoT platform includes an Arduino library for AIS NB-IoT shield, CoAP protocol, a dashboard, and an API. 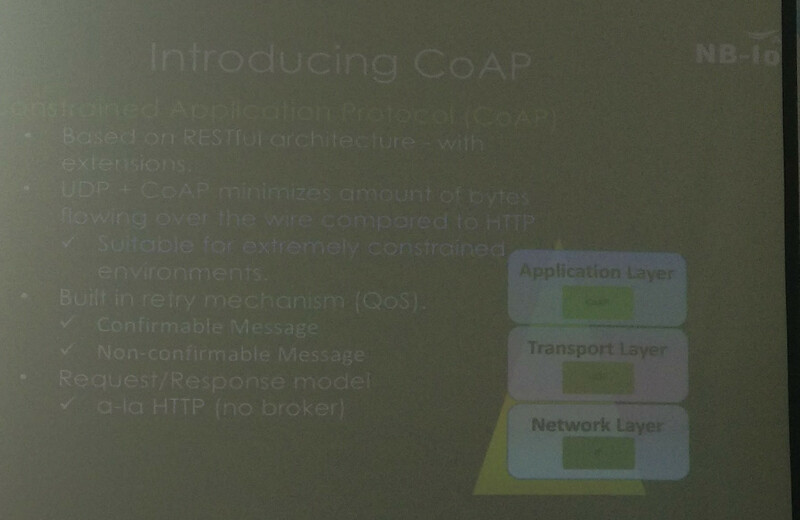 Some IoT projects use the REST API (HTTP) or MQTT, but CoAP over UDP is recommended in this case, because it minimizes the amount of data required compared to HTTP, and hence saves power. AIS NB-IoT Arduino library and sample code can be found on Github, and works with Arduino 1.8.1 or greater. 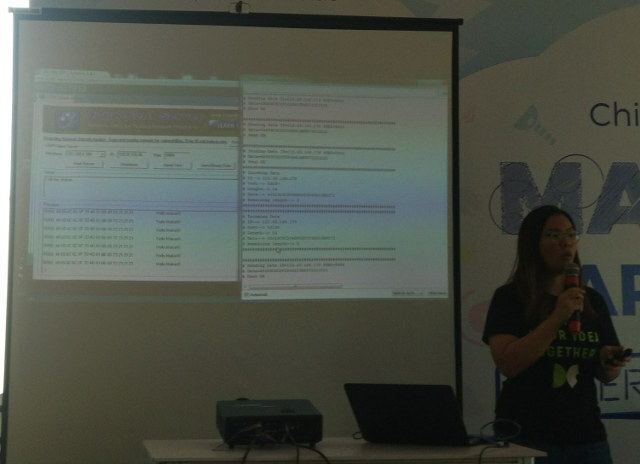 Next up was time for a demo from an AIS representative showing transmission and reception of data with one base station that was enabled with NB-IoT for the event. 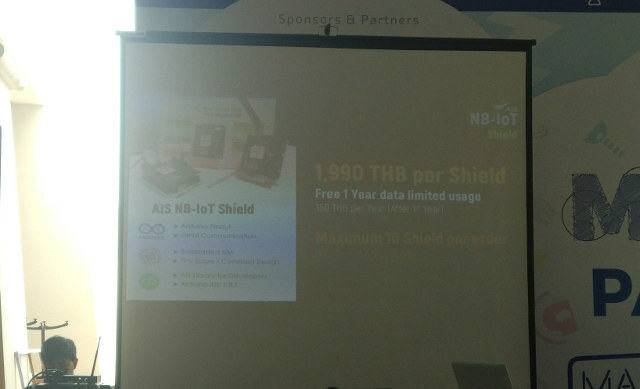 If you are based in Thailand, it’s now possible to register your interest for AIS NB-IoT Arduino shield that will be sold for 1,990 THB (~$61) and ship on February 14, 2018. The registration page is only opened until December 9th. I was expecting some more details about the kit on that page, but sadly it’s just a form asking for contact details. It should be noted that only a few base station will work with NB-IoT at first, with connectivity first available in Bangkok around AIS D.C., AIS SC Tower, and Chulalongkorn University, and upcountry close to Chiang Mai Maker Space, Prince of Songkhla University, and Khon Kaen University. Anywhere else and you will likely not be able to connect at least in early 2018. 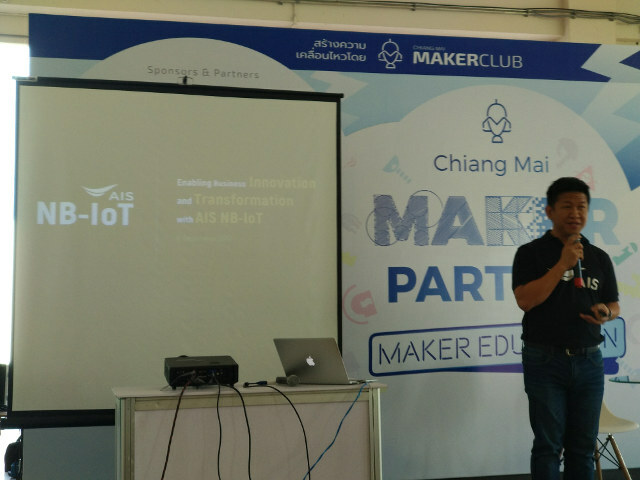 Finally, we got a demo from a member of the Chiang Mai Maker Club that got an early sample of the Arduino shield, connected it to an Arduino Mega with GPS, and various sensors, and as I understand that retrieved data while flying a drone (TBC). 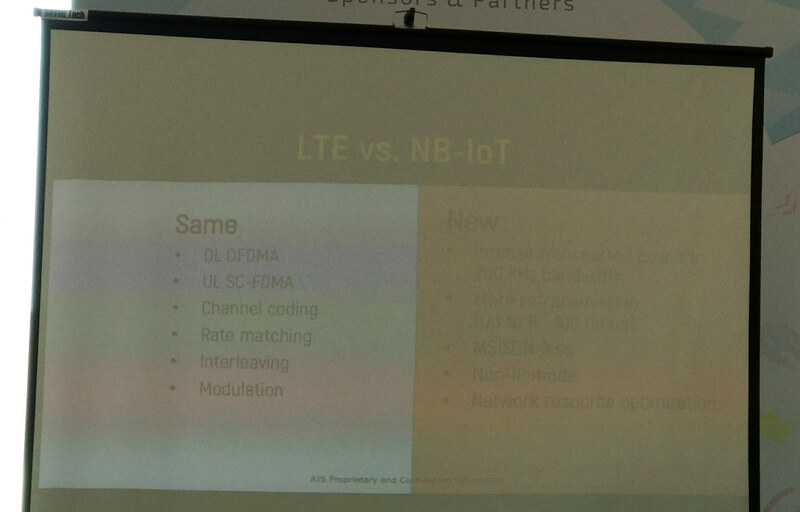 I talked with AIS a little bit after the event, asking confirmation about initial coverage, and since it’s not exactly free to enable NB-IoT, despite using the same LTE base stations, they will only enable a few as previously mentioned. 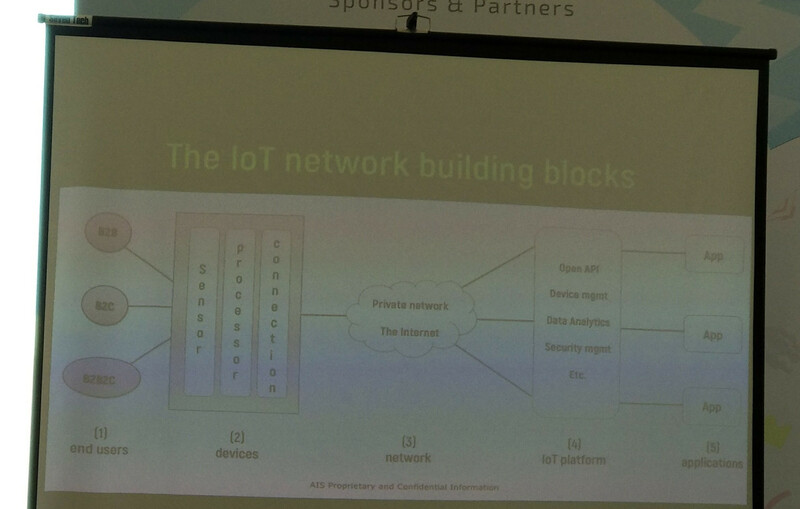 Considering NB-IoT will only be enabled for the 4-day event at the exhibition center, I suspect they may be recurring fees or royalties that AIS may have to pay to maintain the network. Thank you for info. Did you register your interest? Yes, I registered my interest, but mostly to check if I would get more info (and I didn’t). If I can’t use it all around Chiang Mai, and need to go to the Makerspace to test it, it’s not really convenient. Hello, I don’t understand? Maker space is in City center. Isn’t it? Why inconvenient can you explain please? Inconvenient for me because I don’t live in the city center 🙂 But I guess anybody living in the moat or around you get access. Not sure about the exact range / coverage. 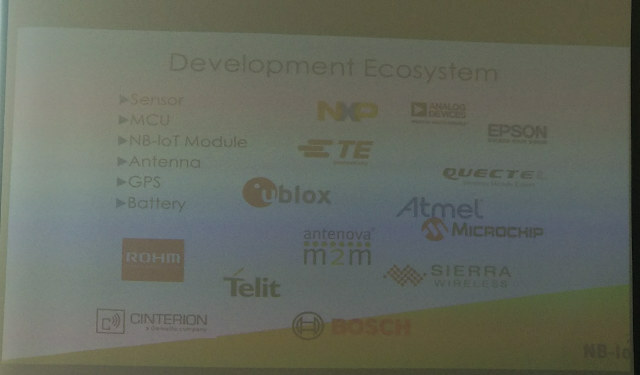 CAT is taking pre-orders for their LoRa development kit. CAT LoRaWAN service will be 300 Baht per year. 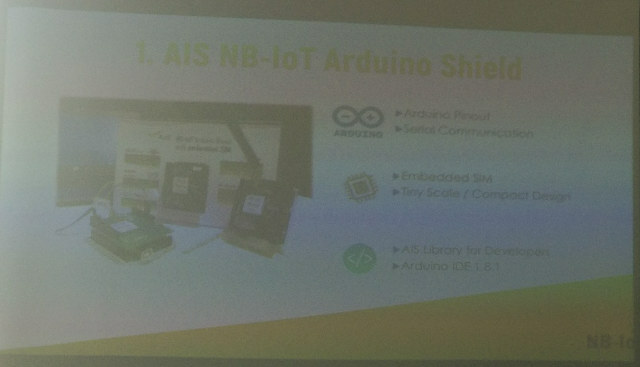 AIS is now taking orders for their NB-IoT shield, and added more details in the github repo linked in the post.